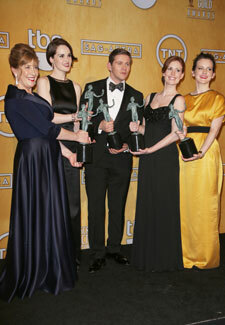 It’s been a great week for the Downton Abbey team. Just days after winning the Best Drama prize at the National Television Awards, the cast picked up the Best Drama Ensemble award at the Screen Actors Guild ceremony in America. The win came as a shock to many, as the show was up against some serious competition in the shape of Homeland, Mad Men, Breaking Bad and Boardwalk Empire. Actress Phyllis Logan, who plays Mrs Hughes, accepted the award alongside castmates Michelle Dockery, Allen Leech, Sophie McShera and Amy Nuttall. Other big winners at the awards which honour actors in the year’s biggest film and TV series included Oscar favourites Daniel Day-Lewis, Jennifer Lawrence, Tommy Lee Jones and Anne Hathaway. Homeland’s Claire Danes also took home a gong, while her co-star Damian Lewis lost out to Breaking Bad’s Bryan Cranston. One other Brit winner was Skyfall, which took home the prize for Best Action Performance by a Stunt Ensemble.